Update: Audible and Amazon have now clarified audio versions of Kindle ebooks you already own start at £2.99 (about $4, AU$5) but will differ in price. Ten years after Amazon released its first ever Kindle, the retailer has announced the all-new Kindle Oasis – and it may just be the product to tempt you to upgrade your ereader. 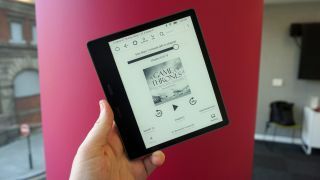 The upgraded Kindle Oasis is larger than last year’s Oasis model, and packs the largest screen ever seen on an Amazon e-reader at seven inches. The screen is backlit as on previous models and brings back adaptive auto brightness too, missing from the original Oasis. It has an aluminium design that feels and looks like a departure from the plastic models we’ve seen in the past. That design change has allowed Amazon to create its first ever waterproof Kindle, so you can use the new Oasis in the bath or by the beach and not have to worry about splashing water on it – and if you do drop it in the bath you’ll have a full hour to recover it, as the Oasis can survive in two meters of water for up to 60 minutes. One of the biggest upgrades for the new Kindle Oasis is that it comes with audiobook playback capabilities that allow you to play Audible titles directly from the ereader. This is something Amazon has dabbled with before, with the older models with physical keyboards previously offering similar functionality, but it's a feature that has been missing on the last few generations of Kindle. You can listen to your books on either Bluetooth headphones or Bluetooth speakers – there’s no way of listening with wired headsets here as there’s no 3.5mm headphone jack, and there's no built-in speaker either. If you own both the ebook and Audible version of the same title, you can seamlessly switch between both. Amazon has said that if you own an ebook you'll also be able to buy the audio title starting at only £2.99 (about $4, AU$5). It means you can be half-way through a chapter of The Girl In The Spider's Web on your train commute and continue listening from where you left off when you get into your Bluetooth-enabled car, without having to scrub through the audio to find your page. The new Kindle Oasis can be pre-ordered now and Amazon will commence shipping in the coming weeks. If you're in Australia, preorders for the latest Kindle Oasis will begin shortly at JB Hi-Fi and Officeworks, with the e-reader hitting shelves at other stores soon after. It'll also cost less than the last model, starting at £229.99/$249.99/AU$389 compared to the starting price of £269.99/$289.99/AU$449 for the 2016 Oasis. The cheapest version comes with 8GB of storage, while there's also a 32GB version that costs £259.99/$279.99 (Australian pricing is currently unavailable for this model) and another 32GB variant with free cellular connection to download books on the go for £319.99/$349.99/AU$529. Amazon will be discounting lots of its products on Black Friday too, so we may see the price of some or all Kindles drop then.